other than by extrapolating past technical knowledge into the present. forecasting must be considered. Computer technology doubles in performance about every two years. exist? What types of materials will exist and what types of components will our customers require? What production rate will we need and will technology exist to support this production level? information and may be part of the company's strategic planning process. performance or scope (e.g., integration complexity). (or scope) over cost and schedule. complexity at a given point in time. schedule, and risk are understood. associated design will contribute to a project's technical risk, and can also lead to cost and schedule risk. developed and implemented where risk information was made available to key decision-makers. The risk management process, however, should be designed to do more than just identify the risk. in reducing these selected risks to the desired level. people agree that risk involves the notion of uncertainty. Can the specified aircraft range be achieved? with occurrence must also be considered. measurable parameters and must be estimated by statistical or other procedures. Figure 44.1: Overall risk is a function of its components. 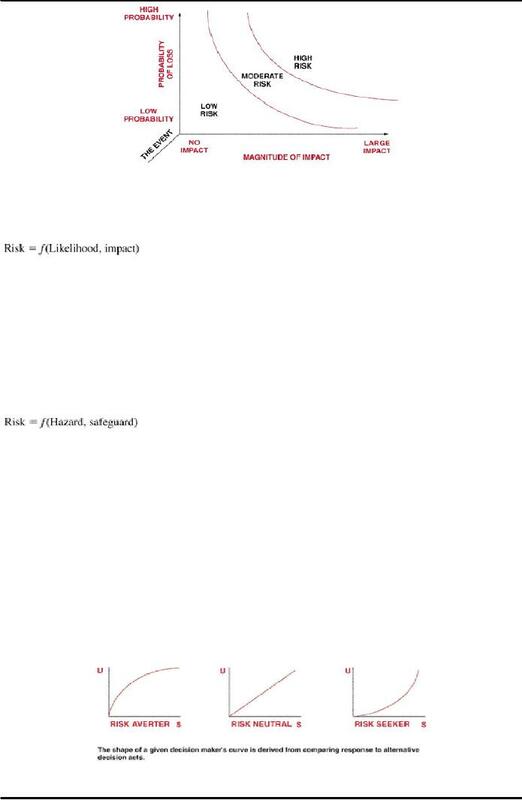 Figure 44.1 shows the components of risk. must be considered in risk management. favorable are called opportunities, whereas unfavorable events are called risks. overcome them. If enough safeguards are available, then the risk can be reduced to an acceptable level. with risk is based in part upon the project manager's tolerance for risk. case is the amount of money at stake. prefers a more certain outcome and will demand a premium to accept risk. A risk lover prefers the more uncertain outcome and may be willing to pay a penalty to take a risk. determine how risks have changed. is reactive (e.g., a "problem solver"), then he will do nothing until the problem actually occurs. attempt to reduce the likelihood of an event occurring and/or the magnitude of its impact. The external risks are outside of the project manager's control but may affect the direction of the project. Internal (nontechnical): Labor stoppages, cash flow problems, safety issues, health and benefit plans. systems, facilities, or contractors to evaluate their risk levels. 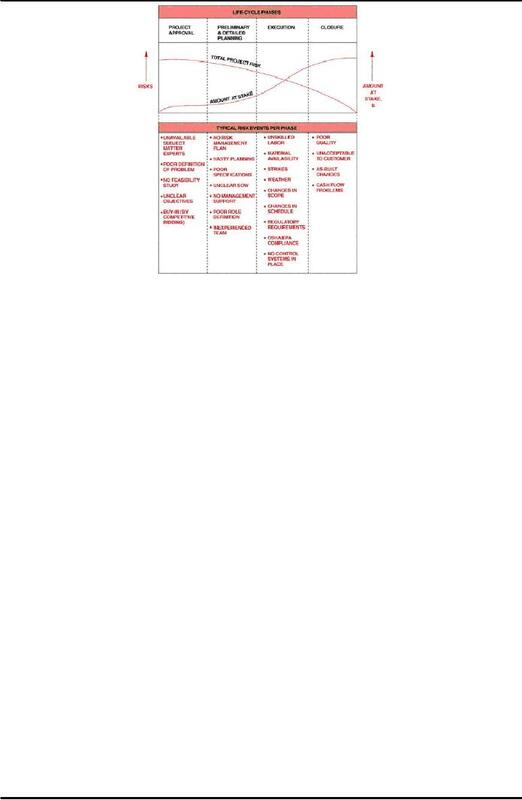 identifies a template for each major technical activity. Each template identifies potential areas of risk. reducing the risk in each identified area. which forces disciplined, consistent treatment of risk. However, using any method in a "cookbook"
identify other factors that may introduce technical, schedule, cost, program, or other risks. strategies. The elements in the payoff table are the outcomes for each strategy. A payoff matrix based on decision-making under certainty has two controlling features. larger gains or smaller losses than any other strategy for all the states of nature. · There are no probabilities assigned to each state of nature. situation, higher profits are usually accompanied by higher risks and therefore higher probable losses. process risks to increase the likelihood of meeting cost, performance, and schedule objectives. issue or process to refine the description of the risk, isolate the cause, and determine the effects. updating risk handling strategies, as appropriate. · Develop and document an organized, comprehensive, and interactive risk management strategy. · Determine the methods to be used to execute a program's risk management strategy. · Plan for adequate resources. often the risk management plan (RMP). define the reporting, documentation, and communication needs. disadvantages depending on the situation. management actions. It is often a difficult and time-consuming part of the risk management process. have a large impact on program outcomes. identification being the first step. number of potential risks that often occur in moderate- to large-scale programs. the program, customer, and users for concerns and problems. Some degree of risk always exists in project, technical, test, logistics, production, and engineering areas. Consequently, risk identification must continue through all project phases. its source. Most sources are either objective or subjective. the financial risk is the greatest. not interact on a face-to-face basis and may not even know who else sits on the panel. Step 2: Each expert is asked to make an anonymous prediction on a particular subject. make new predictions based upon the feedback. The process is then repeated as necessary. Step 1: A panel is convened and asked to generate ideas in writing. Step 2: The ideas are listed on a board or a flip chart. Each idea is discussed among the panelists. competitor activities, bad weather, inflation, recession, customer response, and availability of resources. and insurance for project materials, equipment, and properties. party actions, such as equipment replacement and debris removal. given the responsibility to provide the bundled package, but it is still paid for by the owner/customer. · Can the option be feasibly implemented and still meet the user's needs? · What effect does the option have on the system's technical performance? Risk handling options include: risk assumption, risk avoidance, risk control, and risk transfer. chosen for each risk issue. or fall-back positions. I will do what is expected." warranty, or transfer the entire risk to them. Perhaps I can convert the risk into an opportunity."